Given the current lack of housing across many countries in the world, it’s not surprising that the industry is looking for fast and efficient alternatives to traditional building techniques. These traditional techniques are generally slow, costly and require a large amount of labor. Construction is also a dangerous industry, with many work-related deaths per year. How can we make construction safer and more efficient? Many other industries are looking towards robots to provide an autonomous element of their workforce, so it’s no real surprise that attention has also turned to the possibility of using robots in building construction. It is also clear that there is almost no end to the variety of materials used and structures that can be achieved using 3D printers. A team at the Massachusetts Institute of Technology (MIT) have just extended the scope of these remarkable printers to include house building. Their robot printer, dubbed the Digital Construction Platform (DCP) was reported in the Journal Science Robotics and has proved itself capable of constructing a small dome shaped building in less than 14 hours. The DCP system is made up of a tracked vehicle which includes a large robotic arm. This arm also includes a smaller, more precise arm at the end, which is designed to work in conjunction with a range of standard construction nozzles used for pouring concrete, spraying insulating material or a whole range of other materials. The difference with this 3D printing system is that it is not fixed in place so can, in theory, construct buildings of any size and at a wide variety of locations. As a test, the team set the robot printer to work building a dome which was 50-foot wide and 12-foot high. The done was completed within 14 hours of printing time. The material chosen was polyurethane foam, which is often used as a framework in standard buildings, before being filled with concrete. Of course, as well as improving safety, this kind of technology could be the perfect solution to building structures in inhospitable regions. The DCP could potentially be used to construct emergency shelters after natural disasters, when it is difficult to bring materials and workers on site quickly and safely. It could also be used in extreme environments such as Antarctica, or even Mars. The robot has also been designed with autonomous work in mind. It comes with a scoop which can both prepare and level the building site as well as collecting building materials from the local area. It can also be powered by solar panels, allowing it to operate in remote areas. 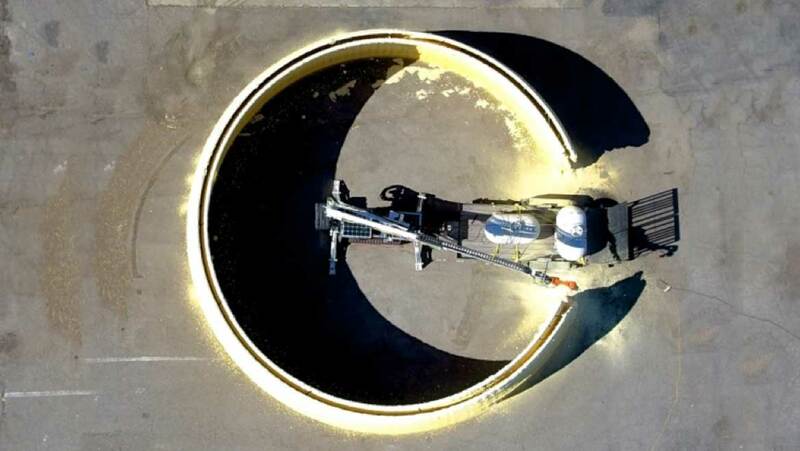 By aligning their robotic design techniques with traditional building methods, the team have ensured that it should be easy to integrate their robot into both existing methodologies and building sites with the minimum of fuss. Keating also hopes that integrating robots such as these into the construction industry could allow for buildings to be better adapted to the environment around them. A pre-build survey of the site using radar could help locate the best positions for supporting pillars. The thickness of the building’s walls could also be varied, depending on the orientation of the building. It seems as though the potential of 3D printers is unlimited and who knows, one day soon we might see the DCP creating emergency shelters after an earthquake, or perhaps even constructing buildings on Mars.